A good covered calls calculator will help you answer the question "should I roll my position?" for an existing covered call position. 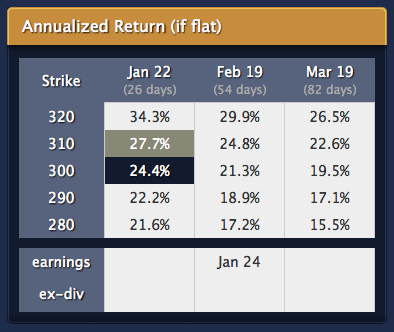 When rolling you will want to consider important variables like: the bid/ask spread, time premium remaining, earnings release dates, and ex-dividend dates. Your covered calls calculator should include all of these. What does rolling a covered call mean? Rolling a covered call position means you buy back the option portion of the position and then sell a different option (either a different strike, or expiration month, or both). Because options have bid-ask spreads you will need to consider that you have to pay the 'ask' when you buy back the existing option, and you receive the 'bid' when selling the new option (you may do slightly better with limit orders that split the bid/ask but most calculators will assume you pay the ask and receive the bid so that they give a result that you could actually achieve). The top rows shows that you will have to pay $2755 to buy back the Jan 300 option, and then on the middle row it shows that you will receive $1940 for the Jan 310 option. The bottom row shows that this rolling will cost you $815 since the option you are buying (Jan 300) costs more than the option you are selling (Jan 310) but your overall profit is increasing by $185 (as long as AAPL stays above 310 by expiration) because you are raising the strike price by 10 points (300 -> 310). Using a covered calls calculator that has automatically updating prices, integrated earnings release dates, and ex-dividend dates is a huge time saver. This kind of calculator will help you optimize the time premium you receive each month, as well as keep you out of trouble by keeping you aware of important dates. The old way of using a spreadsheet with incomplete and non-updating information typically leads to sub-optimal results.